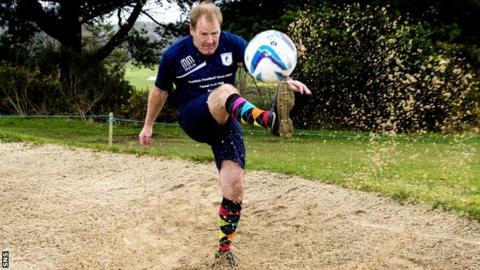 Footgolf has arrived in Scotland, with former Celtic midfielder Murdo MacLeod delighted it has been given the green light after playing for the first time. The new sport, which involves kicking a football round a golf course, is already played in 22 countries. And the first Scottish Footgolf Open will be hosted by Cowal Golf Course in Dunoon on 11 and 12 April. "It's just great fun," said MacLeod, who is a keen golfer, after trying out Footgolf for the first time. The former Scotland international will be joined by other ex-footballers, Gordon Smith, Stuart McCall, Alan Rough and Tom Boyd, in the Open field. "You're standing on the first tee with a size 5 football," MacLeod told BBC Scotland. "You take a good run at it and you kick the ball up the middle of the fairway, you try to get your next shot on to the green and a couple of passes into the hole. "Obviously we don't know how far it's going to go because you're coming on to a golf course and not every golf course would allow people on to kick balls. "But you're not using the greens - they are the winter greens and it is a bigger hole, about 20 inches across. "It will give people another opportunity to get out there when the sun shines." Organisers say it has already proved to be a big success with former professional footballers in countries like the Netherlands. The UK Footgolf Championship will be held at Brentwood on 10-11 May, the UK Classic at Bridlington on 7-8 June and the UK International Open on 9-10 August in Manchester. Meanwhile, a Footgolf World Cup is planned in a couple of years' time. Cowal Golf Club captain Donald MacKay added: "We believe that Footgolf shows that a golf club can provide more than just one use for its community - with any additional revenues generated being available for reinvestment into the course for the benefit of our members."